Poznań and Poznanians have their time-honored, well-known traditional staples. Everyone has heard about pyrki with gzik (tomatoes served with paste-like ground cottage cheese with cream and onion) which you will find in every Poznan home on Friday, or szneka with glanca (glazed sweet bun) served with afternoon coffee. If you don’t know what plyndze are, or how to prepare “blind” fish, then you need to check out the Poznan Dialect and Local Cuisine tabs on our website. You will probably hear most people say that Poznanians are really Scotts exiled from Scotland for being too frugal with their money. Indeed, there is a certain common-sense to how we spend our hard-earned bejmy – but don’t think that means we take ourselves too seriously! On the contrary, we love to laugh at ourselves. We collected some of the most interesting jokes used by Poznanians in the “jokes” tab on our website. 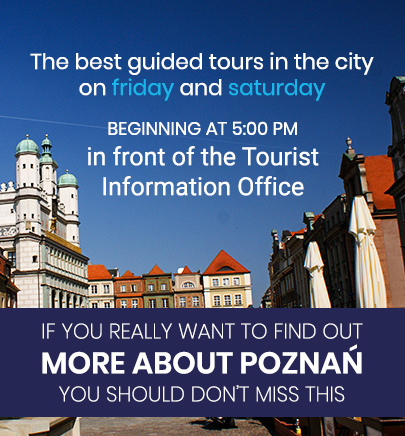 If you wish to know more about Poznan and Poznanians then during your visit to the garden of Przemysl you must go for a guided walk with one of the tour guides from Visit Poznan. Godejcie po naszymu, or about the Poznan dialect. Mogłem se wreszcie lajsnąć wewten chabas, przytaśtałem go ze składu w innym fyrtlu, naprzeciw Ceglorza, a to bez to, że mi bimba ućkła. Sounds too exotic? If you translated it to contemporary Polish it would sound like this: “I was finally able to buy the meat, I brought it all the way from a shop in another quarter, located opposite the Cegielski Factory, and that’s because my tram got away”. The Poznan dialect is slowly becoming extinct, as is the case with most dialects. However, currently it is still being used by Poznanians and residents of Wielkopolska (with the exception of some of its elements). The dialect is also common for residents of the Prussian Partition, with the exception of Upper Silesia, with which it shares a certain number of words borrowed from the German language. Let’s not be surprised if someone is called a „pierdoła” – that word is considered slang and vulgar in parts of Wielkopolska, and means someone spreading gossip or news which are not confirmed or which are unimportant. The word “wiara”, which in Polish means faith, has nothing do with religion in Poznan, it just denotes a group of people. You cannot mention the Poznan dialect without mentioning Stary Marych, who has been for more than a dozen years glancing at the thousands of Poznanians using the main pedestrian artery in the city, Półwiejska street. It’s a fictional character, created by Juliusz Kubel. Stary Marych is the main character in a cycle of articles titled “Blubry Starego Marycha” (Tales of Stary Marych) written in the Poznan dialect. Since 1983 the radio (the Poznan branch of the Polish National Radio, later Radio Mercury, and now the Poznan Radio) has aired a show where Poznanians could listen to a performance of the tales done by the late actor Marian Pogasza. The character has worked its way into Poznanian’s hearts, and become so dear that when the actor performing the show passed away in 2001 a bronze statue of a man with a bike, Stary Marych, was created and put in place at the at the junction of Półwiejska Street, the pedestrian artery, with Strzelecka Street. The facial features of the sculpture closely resemble those of the late actor Marian Pogadasz. The statue itself does not commemorate the actor however, but it’s the only monument dedicated to a dialect in Poland and despite its relative young history it has already become a vital part of the city.